Last week I posted a little teaser on my Facebook page about some exciting things that have been happening behind the scenes and today I'm sharing one of those things. 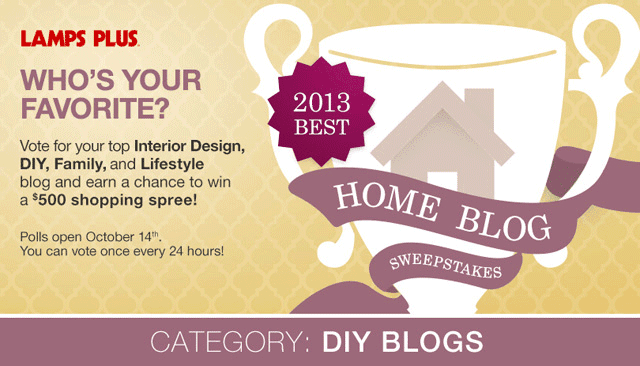 I received an e-mail from Lamps Plus on Friday letting me know that I've been nominated for their 2013 Best Home Blog Awards in the DIY category! I'm pretty sure my eyes bugged out of my head and my jaw hit my desk! Me?! Are you sure?! Honored doesn't even begin to describe how I feel! Voting opens today, October 14 and runs until November 15. You'll be able to vote for your favorite blog on the Lamps Plus Facebook page once every 24 hours. The highest vote-getter in each of the four categories (interior design, DIY, family, and lifestyle) will receive a $1,000 shopping spree from Lamps Plus and one lucky voter (maybe you?!) will receive a $500 shopping spree! What would you spend the $500 on if you won? That is so awesome. Congrats! Holy moly, that's phenomenal! Congratulations!!! You totally deserve it. Oh sweet! You definitely deserve it girl! Wow!!! Congrats! Not surprised at all... you are the queen of DIY! Heading over now to vote! You and Amber both deserve these nominations! You rock!!! That is so well deserved. Your projects are always fresh and well thought out and fabulously executed. Congratulations!! !